How to highlight Saturday, Sunday weekend dates in calendar. 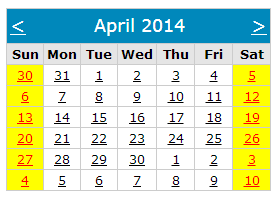 How to highlight just Sunday dates in calendar i.e. marking holidays on calendar. Or you can also write the following code block. Output will be the same.
" I hope you have got How to highlight weekend dates in Asp.Net Calendar control and If you like my work; you can appreciate by leaving your comments, hitting Facebook like button, following on Google+, Twitter, Linked in and Pinterest, stumbling my posts on stumble upon and subscribing for receiving free updates directly to your inbox . Stay tuned and stay connected for more technical updates."